In order to help surgeons come up with a way to distinguish brain tumors from healthy tissue, scientists are trying to use a scorpion protein. Jim Olson, pediatric neuro-oncologist at Seattle Children’s Hospital, came across a report that described a scorpion toxin that binds to brain tumors, but not to healthy cells. By linking a synthetic version of this protein to a molecule that glows in near IR light, researchers think that they might have found a way to illuminate tumorous cells. The compound was injected into the tail vein of a mouse, whose body harbored a transplanted human tumor. Within 15 to 20 minutes, the tumor started to glow, and was distinct from the rest of the mouse. Blaze Bioscience has licensed the technology from the Fred Hutchinson Cancer Center, and expects human trials to begin in late 2013. The toxin can also cross the blood-brain barrier, which prevents most compounds from entering. The toxin is safe, even though it was derived from venom. Early clinical trials of a version of the scorpion toxin tagged with radioactive iodine were shown to be safe in patients. Animal studies of the tumor paint indicate that it could demarcate prostrate, colon, breast and other tumors. The potential this compound has to save healthy brain tissue and improve patients’ lives is told in a short video below. 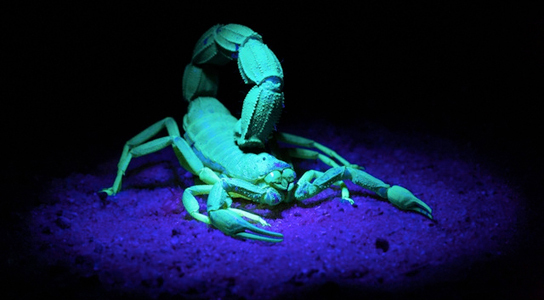 Be the first to comment on "Scorpion Protein Helps Illuminate Brain Tumors"